Of all the sweet treats that I enjoy during the holiday season, fudge is the most soft and chocolaty snack I make for my family and guests. Some fudge recipes ask for careful temperature monitoring and lots of beating by hand to achieve the perfect texture, but this creamy fudge recipe relies on marshmallows to create a smooth and foolproof result. If you don’t like nuts, you can omit them. In a heavy saucepan, over low heat, melt the chocolate chips with the marshmallows, the sweetened condensed milk and salt. Do not over cook. Remove from heat and stir in vanilla and nuts. Spread evenly into a waxed paper-lined 8 or 9 inch square pan. Chill for at least 2-3 hours or until firm. Turn fudge, peel off paper and cut into squares. I hope you enjoyed my Foolproof Creamy Fudge as much as my family and I did. If you make it, make sure to share with us on Facebook or Twitter! Also, check out all of our other Recipes. Wow!!! These look delicious! Thanks! 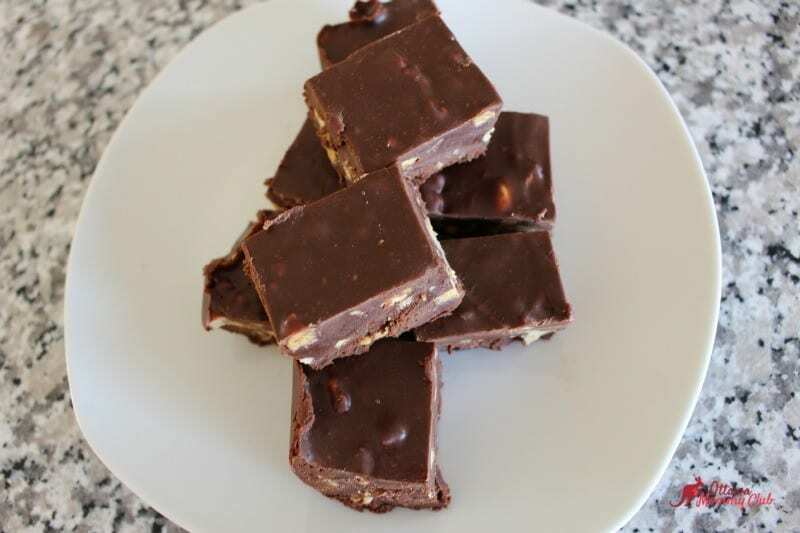 Sounds yummy and easy to make which I love when it comes to fudge. Going on the baking list for this weekend. Oh it does sound chocolately delicious,thanks for sharing your recipe ! I have made fudge before with condensed milk, it works lovely. I’m going to try this – it looks really easy and I’ve been looking for an easy chocolatey fudge recipe. Thank you! This sounds so easy and so yummy! I can’t wait to make it for Christmas! Just wanted to let you know I made this and it turned out really well. I did leave out the nuts and pressed crushed candy canes on the top. Just got to run out before the stor closes and get some sweetened condensed milk,we are going to make this tonight ! This fudge looks delicious.. I need to make this for new years eve!! I wonder if I could make this a little healthier but still delicious using coconut cream rather than condensed milk? Sounds like a delicious fudge recipe, I’ll have to try this. This is so easy to make, I think I am going to make some for my mother for Mother’s Day, she would love a nice surprise like this!! OMG I have a severe sweet tooth and this recipe is a cure. Oh, I’ll be making these soon! Let me know how you like the fudge! Sounds like a nice easy recipe!! I must try I just love fudge but have never made it. This one sounds like it would work out, I love the addition of marshmallows and nuts! I love chocolate and I love fudge so when the two are together I would be in heaven. Thanks for sharing. I love homemade fudge but didn’t get time to make any this Christmas. This looks so yummy but I’m curious, “are the marshmallows for flavor or are they extra like the nuts” because I wouldn’t want it for an extra. Flavour and it help to stick the fudge together if I remember correctly. You can omit it.